im just wondering what the reasoning behind not being able to list something for sale on the forum if its listed for sale elsewhere.. it makes no sense to me. 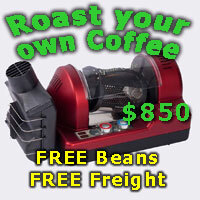 Coffee Snobs is not an auction site nor are we here to drive traffic to auction sites. Far to often people have joined simply so they can then post items for sale elsewhere having contributed jackall to the community here. Our rules are simple and few and have been in place almost unchanged for over a decade during which they have worked well and kept such fly-by-nights and spammers to a minimum. Andy, coffeechris, Dimal and 4 others like this. ok but still doesnt make much sense, you wont get many sales posts at all if you are restricted to only posting on the one site. posting things for sale here is contributing to the community here i would think the other rules could be extended to a longer membership time and more posts and it would be much better for anyone trying to sell an item. i understand not being an auction site yourself, but why not post links to other places for sale items? i mean there is sections driving sales all over the forum.. places to buy good coffee, equipment reviews, etc im just a guy trying to get a good home for a coffee machine i restored. Cain I can see you are annoyed as a long standing member who contributes to the forum, but I will take a guess what it looks like from the other side of the fence. This forum exists for us all due to the generosity of Andy and the other sponsors. The sponsors are hoping to get a return on this sponsorship, so a few simple rules exist to help that, including no links. Those links have a direct dollar value and sales value in driving traffic to sponsors sites, so as they are paying the deserve to restrict links from people not supporting the community. Sales which are only listed on CS help the community and sponsors by attracting more people to the site, therefore adding value to their sponsorship. By comparison Ebay doesn't sponsor or help this site. Predominantly the sponsors are Aus based so pay Aus tax and gst. Ebay sends their invoices from an overseas subsidary so doesn't pay Aus tax or gst. They actively emailed against their foreign sellers having to pay Aus GST while competing against Aussie companies paying all their tax obligations (including our sponsors). They even showed no loyalty to you, who will pay them a handsome fee if you sell through them, there were a bunch of other choices on your page from within the ebay eco system and a group of external advertisers withs ads targeted against yours! Do they deserve a free link, I would suggest not. These are only my opinions but another way of looking at things. coffee_mum, Dimal and LeroyC like this. Maybe the small steady stream of sale offers Coffeesnobs gets is all we need. Have you seen what Ebay has turned into over the years? A collection of junk with over 1000 listings for the same item, with a few good listings thrown in. I respect the questions you have asked, but i like how this forum is runs. A few simple rules to follwo and you can see how its stayed that way over the last 10 or so years because of those rules. Andy, coffee_mum, Dimal and 1 others like this. A few other forums I frequent have the same rule and I believe a fair point is that it's to keep things simple and fair: Item is available for sale. Buyer arranges to purchase. Deal is done. Once the item is advertised elsewhere it becomes a bidding war/unintentional 'shill bidding' style with no transparency what is happening. Ultimately it wastes more people's time, with someone unhappy at the end on missing out on the purchase, or paying higher than the advertised price. Andy, coffeechris, Dimal and 2 others like this. If you are looking for a "good home" for it you will find a great home by advertising it here and offering it to our community of passionate coffee lovers. If you are looking for maximum sale price then don't post it here, instead, list it all over the internet or put it on an auction site and take the highest bid. The (FREE) for sale pages at CoffeeSnobs exist so members can offer items to other members at a fair price knowing it's going to a good home. That makes lots of sense to me. coffeechris, coffee_mum, Dimal and 9 others like this. Cain I can see you are annoyed as a long standing member who contributes to the forum. Dimal, Yelta, LeroyC and 1 others like this. Good point Andy, deduct the cost of Ebay fees (just used their calculator and it came up as $120 for a $1200 coffee machine) and the machine could be going to a good home with savings by both parties. Cain I noticed the Boema didn't sell at $1200. I wonder if it would sell easier at a lower price on a forum like this?